Canada (pronounced /ˈkænədə/) is a country occupying most of northern North America, extending from the Atlantic Ocean in the east to the Pacific Ocean in the west and northward into the Arctic Ocean. It is the world's second largest country by total area. Canada's common border with the United States to the south and northwest is the longest in the world. Canada is a good example of the way peoples of different ways of life and different languages can live side by side under one government. The population of Canada has risen from 11,5 million in 1941 to 25 million in 1980. Most of the new-comers are from Europe, Asia and the USA, so that today less than 44% of Canada’s population is of British origin. Quebec Province is still 90% French. There are some groups of French Canadians in Ontario and Manitoba, but the numbers are quite small. There are many Indians, Pakistanis and Chinese, and also blacks from the USA, among the immigrants who are pouring into Canada now. Some Canadians are afraid that before long Canada will have colored citizens that white. Other Canadians are disturbed by the growing racism in their country. Canada, like so many countries, has only just begun to treat her own non-white citizens, Eskimos (or Inuit) and the Indians, as generously as they deserve. The Indian and Eskimo populations have grown quite a lot in the last few years. The government is at last realizing that it has a duty towards this people that it has neglected for so long. All Canadian children have to learn both French and English at school, but Franco phones and Anglophones do not enjoy learning each other’s language. Still, most Quebecois middle class families, living in Montreal are bilingual - they speak English and French equally well. Until the Second World War, every Canadian province except Quebec was overwhelmingly British. Some Canadians were more patriotic than the British them-selves and were really angry if anyone walked out of a cinema while ‘God Save the King’ was being played. Now Canadians think of themselves as a people in their own right, not tied to either Britain or the USA. The USA has not been a threat to Canada for almost two hundred years. In fact, the 6,416 km US-Canadian frontier is the longest continuous frontier in the world, has no wire fence, no soldiers, no guns on either side. It is called ‘The Border’. The land occupied by Canada was inhabited for millennia by various groups of Aboriginal people. Beginning in the late 15th century, British and French expeditions explored, and later settled, along the Atlantic coast. France ceded nearly all of its colonies in North America in 1763 after the Seven Years' War. In 1867, with the union of three British North American colonies through Confederation, Canada was formed as a federal dominion of four provinces. This began an accretion of provinces and territories and a process of increasing autonomy from the United Kingdom. This widening autonomy was highlighted by the Statute of Westminster of 1931 and culminated in the Canada Act of 1982, which severed the vestiges of legal dependence on the British parliament. A federation consisting of ten provinces and three territories, Canada is governed as a parliamentary democracy and a constitutional monarchy with Queen Elizabeth II as its head of state. It is a bilingual nation with both English and French as official languages at the federal level. One of the world's highly developed countries, Canada has a diversified economy that is reliant upon its abundant natural resources and upon trade—particularly with the United States, with which Canada has had a long and complex relationship. It is a member of the G8, G-20, NATO, OECD, WTO, Commonwealth, Franco phone, OAS, APEC, and UN. The name Canada comes from a St. Lawrence Iroquoian word, Kanata, meaning "village" or "settlement". In 1535, indigenous inhabitants of the present-day Quebec City region used the word to direct French explorer Jacques Cartier towards the village of Stadacona. Cartier later used the word Canada to refer not only to that particular village, but also the entire area subject to Donnacona (the chief at Stadacona); by 1545, European books and maps had begun referring to this region as Canada. From the early 17th century onwards, that part of New France that lay along the Saint Lawrence River and the northern shores of the Great Lakes was known as Canada. The area was later split into two British colonies, Upper Canada and Lower Canada. They were re-unified as the Province of Canada in 1841. Upon Confederation in 1867, the name Canada was adopted as the legal name for the new country, and Dominion was conferred as the country's title. Combined, the term Dominion of Canada was in common usage until the 1950s. As Canada asserted its political autonomy from the United Kingdom, the federal government increasingly used simply Canada on state documents and treaties, a change that was reflected in the renaming of the national holiday from Dominion Day to Canada Day in 1982. Europeans first arrived when the Vikings settled briefly at L'Anse aux Meadows in Newfoundland around AD 1000; after the failure of that colony, there was no known further attempt at Canadian exploration until 1497, when Italian seafarer Giovanni Caboto (John Cabot) explored Canada's Atlantic coast for England. In 1534 Jacques Cartier explored Canada for France. French explorer Samuel de Champlain arrived in 1603 and established the first permanent European settlements at Port Royal in 1605 and Quebec City in 1608. Among French colonists of New France, Canadians extensively settled the Saint Lawrence River valley and Acadians settled the present-day Maritimes, while French fur traders and Catholic missionaries explored the Great Lakes, Hudson Bay, and the Mississippi watershed to Louisiana. The French and Iroquois Wars broke out over control of the fur trade. Benjamin West's The Death of General Wolfe (1771) dramatizes Wolfe's death during the Battle of the Plains of Abraham at Quebec in 1759. The battle was part of the Seven Years' War. The English established fishing outposts in Newfoundland around 1610 and established the Thirteen Colonies to the south. A series of four Inter colonial Wars erupted between 1689 and 1763. Mainland Nova Scotia came under British rule with the Treaty of Utrecht (1713); the Treaty of Paris (1763) ceded Canada and most of New France to Britain after the Seven Years' War. The Royal Proclamation (1763) carved the Province of Quebec out of New France and annexed Cape Breton Island to Nova Scotia. St. John's Island (now Prince Edward Island) became a separate colony in 1769. To avert conflict in Quebec, the British passed the Quebec Act of 1774, expanding Quebec's territory to the Great Lakes and Ohio Valley. It re-established the French language, Catholic faith, and French civil law there. This angered many residents of the Thirteen Colonies and helped to fuel the American Revolution. The Treaty of Paris (1783) recognized American independence and ceded territories south of the Great Lakes to the United States. Around 50,000 United Empire Loyalists fled the United States to Canada. New Brunswick was split from Nova Scotia as part of a reorganization of Loyalist settlements in the Maritimes. To accommodate English-speaking Loyalists in Quebec, the Constitutional Act of 1791 divided the province into French-speaking Lower Canada (later the province of Quebec) and English-speaking Upper Canada (later Ontario), granting each its own elected Legislative Assembly. Canada (Upper and Lower) was the main front in the War of 1812 between the United States and the British Empire. Following the war, large-scale immigration to Canada from Britain and Ireland began in 1815. From 1825 to 1846, 626,628 European immigrants landed at Canadian ports. Between one-quarter and one-third of all Europeans who immigrated to Canada before 1891 died of infectious diseases. The timber industry surpassed the fur trade in economic importance in the early nineteenth century. The desire for responsible government resulted in the aborted Rebellions of 1837. The Durham Report subsequently recommended responsible government and the assimilation of French Canadians into British culture. The Act of Union 1840 merged The Canadas into a united Province of Canada. Responsible government was established for all British North American provinces by 1849. The signing of the Oregon Treaty by Britain and the United States in 1846 ended the Oregon boundary dispute, extending the border westward along the 49th parallel. This paved the way for British colonies on Vancouver Island (1849) and in British Columbia (1858). Canada launched a series of exploratory expeditions to claim Rupert's Land and the Arctic region. Robert Harris's Fathers of Confederation, an amalgamation of the Charlottetown and Quebec conferences. When Canada was formed in 1867 its provinces were a relatively narrow strip in the southeast, with vast territories in the interior. It grew by adding British Columbia in 1871, P.E.I. in 1873, the British Arctic Islands in 1880, and Newfoundland in 1949, Its provinces grew both in size and number at the expense of its territories. 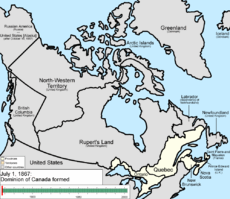 Following several constitutional conferences, the Constitution Act, 1867 brought about Confederation, creating "one Dominion under the name of Canada" on July 1, 1867, with four provinces: Ontario, Quebec, Nova Scotia, and New Brunswick. Canada assumed control of Rupert's Land and the North-Western Territory to form the Northwest Territories, where the Métis' grievances ignited the Red River Rebellion and the creation of the province of Manitoba in July 1870. British Columbia and Vancouver Island (which had united in 1866) and the colony of Prince Edward Island joined the Confederation in 1871 and 1873, respectively. Prime Minister John A. Macdonald's Conservative government established a national policy of tariffs to protect nascent Canadian manufacturing industries. An animated map, exhibiting the growth and change of Canada's provinces and territories since Confederation. To open the West, the government sponsored construction of three trans-continental railways (most notably the Canadian Pacific Railway), opened the prairies to settlement with the Dominion Lands Act, and established the North-West Mounted Police to assert its authority over this territory. In 1898, after the Klondike Gold Rush in the Northwest Territories, the Canadian government created the Yukon territory. Under Liberal Prime Minister Wilfred Laurier, continental European immigrants settled the prairies, and Alberta and Saskatchewan became provinces in 1905. Canadian soldiers won the Battle of Vimy Ridge in 1917. Britain's declaration of war in 1914 automatically brought Canada into World War I. Volunteers sent to the Western Front later became part of the Canadian Corps. The Corps played a substantial role in the Battle of Vimy Ridge and other major battles of the war. Out of approximately 625,000 who served, about 60,000 were killed and another 173,000 were wounded. The Conscription Crisis of 1917 erupted when conservative Prime Minister Robert Borden brought in compulsory military service over the objection of French-speaking Quebecers. In 1919, Canada joined the League of Nations independently of Britain and in 1931, the Statute of Westminster affirmed Canada's independence. The Great Depression brought economic hardship all over Canada. In response, the Co-operative Commonwealth Federation (CCF) in Alberta and Saskatchewan enacted many measures of a welfare state as pioneered by Tommy Douglas in the 1940s and 1950s. Canada declared war on Germany independently during World War II under Liberal Prime Minister William Lyon Mackenzie King, three days after Britain. The first Canadian Army units arrived in Britain in December 1939. Canadian troops played important roles in the Battle of the Atlantic, the failed 1942 Dieppe Raid in France, the Allied invasion of Italy, the D-Day landings, the Battle of Normandy, and the Battle of the Scheldt in 1944. Canada provided asylum and protection for the monarchy of the Netherlands while that country was occupied, and is credited by the latter country for leadership and major contribution to its liberation from Nazi Germany. The Canadian economy boomed as industry manufactured military materiel for Canada, Britain, China, and the Soviet Union. Despite another Conscription Crisis in Quebec, Canada finished the war with one of the largest armed forces in the world. In 1945, during the war, Canada became one of the founding members of the United Nations. The Dominion of Newfoundland (now Newfoundland and Labrador), at the time equivalent in status to Canada and Australia as a Dominion, joined Canada in 1949. Canada's growth, combined with the policies of successive Liberal governments, led to the emergence of a new Canadian identity, marked by the adoption of the current Maple Leaf Flag in 1965, the implementation of official bilingualism (English and French) in 1969, and official multiculturalism in 1971. There was also the founding of socially democratic programs, such as universal health care, the Canada Pension Plan, and Canada Student Loans, though provincial governments, particularly Quebec and Alberta, opposed many of these as incursions into their jurisdictions. Finally, another series of constitutional conferences resulted in the partition of Canada's constitution from the United Kingdom, concurrent with the creation of the Charter of Rights and Freedoms. At the same time, Quebec was undergoing profound social and economic changes through the Quiet Revolution, giving birth to a nationalist movement in the province and the more radical Front de liberation du Québec (FLQ), whose actions ignited the October Crisis in 1970. A decade later, an unsuccessful referendum on sovereignty-association was held in 1980, after which attempts at constitutional amendment failed in 1990. A second referendum followed in 1995, in which sovereignty was rejected by a slimmer margin of just 50.6% to 49.4%. In 1997, the Supreme Court ruled that unilateral secession by a province would be unconstitutional, and the Clarity Act was passed by parliament, outlining the terms of a negotiated departure from Confederation. Canada has a parliamentary government with strong democratic traditions. Parliament is composed of The Crown, an elected House of Commons, and an appointed Senate. Each Member of Parliament in the House of Commons is elected by simple plurality in an electoral district or riding. General elections must be called by the prime minister within five years of the previous election, or may be triggered by the government losing a confidence vote in the House. Members of the Senate, whose seats are apportioned on a regional basis, are chosen by the prime minister and formally appointed by the Governor General and serve until age 75. Four parties had representatives elected to the federal parliament in the 2008 elections: the Conservative Party of Canada (governing party), the Liberal Party of Canada (the Official Opposition), the New Democratic Party (NDP), and the Bloc Québécois. The list of historical parties with elected representation is substantial. Canada's federal structure divides government responsibilities between the federal government and the ten provinces. Provincial legislatures are unicameral and operate in parliamentary fashion similar to the House of Commons. Canada's three territories also have legislatures, but with fewer constitutional responsibilities than the provinces and with some structural differences (for example, the legislative assemblies of the Northwest Territories and Nunavut have no parties and operate on consensus). The Senate chamber within the Centre Block on Parliament Hill. Canada is also a constitutional monarchy, with The Crown acting as a symbolic or ceremonial executive. The Crown consists of Queen Elizabeth II (legal head of state) and her appointed viceroys, the governor general (acting head of state), and provincial lieutenant-governors, who perform most of the monarch's ceremonial roles. The political executive consists of the prime minister (head of government) and the Cabinet and carries out the day-to-day decisions of government. The Cabinet is made up of ministers usually selected from the House of Commons and headed by the prime minister, who is normally the leader of the party that holds the confidence of the House of Commons. The Prime Minister's Office (PMO) is one of the most powerful institutions in government, initiating most legislation for parliamentary approval and selecting, besides other Cabinet members, senators, federal court judges, heads of Crown corporations and government agencies, and the governor general. The Crown formally approves parliamentary legislation and the prime minister's appointments. The leader of the party with the second-most seats usually becomes the Leader of the Opposition, and is part of an adversarial parliamentary system intended to keep the government in check. Michaëlle Jean has served as Governor General since September 27, 2005; Stephen Harper, leader of the Conservative Party, has been prime minister since February 6, 2006; and Michael Ignatieff, leader of the Liberal Party, has been Leader of the Opposition since December 10, 2008. The Constitution of Canada is the supreme law of the country, and consists of written text and unwritten conventions. The Constitution Act, 1867 (known as the British North America Act prior to 1982) affirmed governance based on parliamentary precedent "similar in principle to that of the United Kingdom" and divided powers between the federal and provincial governments; the Statute of Westminster, 1931 granted full autonomy; and the Constitution Act, 1982 added the Canadian Charter of Rights and Freedoms, which guarantees basic rights and freedoms that usually cannot be overridden by any level of government—though a notwithstanding clause allows the federal parliament and provincial legislatures to override certain sections of the Charter for a period of five years—and added a constitutional amending formula. The Indian Chiefs Medal, presented to commemorate Treaties 3, 4, 5, 6 and 7, bearing the effigy of Queen Victoria. Although not without conflict, European Canadians' early interactions with First Nations and Inuit populations were relatively peaceful. Combined with Canada's late economic development in many regions, this peaceful history has allowed Canadian Indigenous peoples to have a relatively strong influence on the national culture while preserving their own identity. The Canadian Crown and Aboriginal peoples began interactions during the European colonialisation period. Numbered treaties, the Indian Act, the Constitution Act of 1982 and case laws were established. A series of eleven treaties were signed between Aboriginals in Canada and the reigning Monarch of Canada from 1871 to 1921. These treaties are agreements with the Government of Canada administered by Canadian Aboriginal law and overseen by the Minister of Indian Affairs and Northern Development. The role of the treaties was reaffirmed by Section Thirty-five of the Constitution Act, 1982, which "recognizes and affirms existing Aboriginal and treaty rights". These rights may include provision of services such as health care, and exemption from taxation. The legal and policy framework within which Canada and First Nations operate was further formalized in 2005, through the First Nations– Federal Crown Political Accord, which established cooperation as "a cornerstone for partnership between Canada and First Nations". The Supreme Court of Canada in Ottawa, west of Parliament Hill. Canada's judiciary plays an important role in interpreting laws and has the power to strike down laws that violate the Constitution. The Supreme Court of Canada is the highest court and final arbiter and has been led by the Right Honorable Madam Chief Justice Beverley McLachlin, P.C. (the first female Chief Justice) since 2000. Its nine members are appointed by the governor general on the advice of the Prime Minister and Minister of Justice. All judges at the superior and appellate levels are appointed after consultation with nongovernmental legal bodies. The federal cabinet also appoints justices to superior courts at the provincial and territorial levels. Judicial posts at the lower provincial and territorial levels are filled by their respective governments. Common law prevails everywhere except in Quebec, where civil law predominates. Criminal law is solely a federal responsibility and is uniform throughout Canada. Law enforcement, including criminal courts, is a provincial responsibility, but in rural areas of all provinces except Ontario and Quebec, policing is contracted to the federal Royal Canadian Mounted Police. A Canadian CF-18 Hornet in La Baie (Bagotville), Quebec. CF-18s have supported NORAD air sovereignty patrols and participated in combat during the Gulf War of 1991 and Kosovo and Bosnia in the late 1990s. Canada and the United States share the world's longest undefended border, co-operate on military campaigns and exercises, and are each other's largest trading partner. Canada nevertheless has an independent foreign policy, most notably maintaining full relations with Cuba and declining to participate in the Iraq War. Canada also maintains historic ties to the United Kingdom and France and to other former British and French colonies through Canada's membership in the Commonwealth of Nations and the Franco phone. Canada is noted for having a strong and positive relationship with the Netherlands, and the Dutch government traditionally gives tulips, a symbol of the Netherlands, to Canada each year in remembrance of the latter country's contribution to its liberation. Canada currently employs a professional, volunteer military force of about 67,000 regular and 26,000 reserve personnel. The unified Canadian Forces (CF) comprise the army, navy, and air force. Major CF equipment holdings include 1,400 armored fighting vehicles, 33 combat vessels, and 861 aircraft. Strong attachment to the British Empire and Commonwealth led to major participation in British military efforts in the Second Boer War, the First World War, and the Second World War. Since then, Canada has been an advocate for multilateralism, making efforts to resolve global issues in collaboration with other nations. Canada was a founding member of the United Nations in 1945 and of NATO in 1949. During the Cold War, Canada was a major contributor to UN forces in the Korean War and founded the North American Aerospace Defense Command (NORAD) in cooperation with the United States to defend against potential aerial attacks from the Soviet Union. Two warships of the Canadian Navy—the Halifax-class frigate HMCS Vancouver (FFH 331) (centre) and the Iroquois-class destroyer HMCS Algonquin (DDG 283)—at Pearl Harbor upon departing to participate in RIMPAC, the world's largest international maritime exercise. During the Suez Crisis of 1956, future Prime Minister Lester B. Pearson eased tensions by proposing the inception of the United Nations Peacekeeping Force, for which he was awarded the 1957 Nobel Peace Prize. As this was the first UN peacekeeping mission, Pearson is often credited as the inventor of the concept. Canada has since served in 50 peacekeeping missions, including every UN peacekeeping effort until 1989, and has since maintained forces in international missions in Rwanda, the former Yugoslavia, and elsewhere. The number of Canadian military personnel participating in peacekeeping missions has decreased greatly in the past two decades. As of June 30, 2006, 133 Canadians served on United Nations peacekeeping missions worldwide, including 55 Canadian military personnel, compared with 1044 military personnel as of December 31, 1996. Canada joined the Organization of American States (OAS) in 1990 and hosted the OAS General Assembly in Windsor, Ontario, in June 2000 and the third Summit of the Americas in Quebec City in April 2001. Canada seeks to expand its ties to Pacific Rim economies through membership in the Asia-Pacific Economic Cooperation forum (APEC). Canadian Leopard 1C2(1A5) during a live fire exercise in Fort Bliss, Texas. Since 2001, Canada has had troops deployed in Afghanistan as part of the U.S. stabilization force and the UN-authorized, NATO-commanded International Security Assistance Force. Canada has committed to withdraw from Kandahar Province by 2011, by which time it will have spent an estimated total of $11.3 billion on the mission. Canada and the U.S. continue to integrate state and provincial agencies to strengthen security along the Canada-United States border through the Western Hemisphere Travel Initiative. In February 2007, Canada, Italy, Britain, Norway, and Russia announced their funding commitments to launch a $1.5 billion project to help develop vaccines they said could save millions of lives in poor nations, and called on others to join them. In August 2007, Canadian sovereignty in Arctic waters was challenged after a Russian expedition that planted a Russian flag at the seabed at the North Pole. Canada has considered that area to be sovereign territory since 1925. 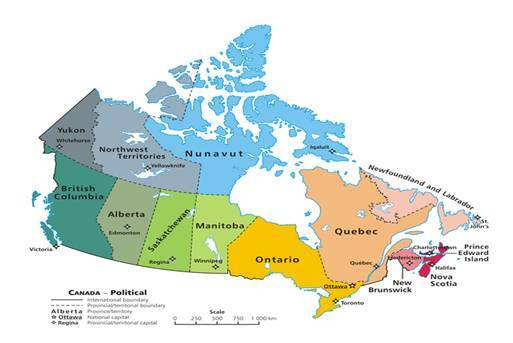 Canada is a federation composed of ten provinces and three territories. In turn, these may be grouped into regions: Western Canada, Central Canada, Atlantic Canada, and Northern Canada (the latter made up of the three territories Yukon, Northwest Territories, and Nunavut). Eastern Canada refers to Central Canada and Atlantic Canada together. Provinces have more autonomy than territories. The provinces are responsible for most of Canada's social programs (such as health care, education, and welfare) and together collect more revenue than the federal government, an almost unique structure among federations in the world. Using its spending powers, the federal government can initiate national policies in provincial areas, such as the Canada Health Act; the provinces can opt out of these, but rarely do so in practice. Equalization payments are made by the federal government to ensure that reasonably uniform standards of services and taxation are kept between the richer and poorer provinces. A clickable map of Canada exhibiting its ten provinces and three territories, and their capitals. Canada occupies a major northern portion of North America, sharing land borders with the contiguous United States to the south and the U.S. state of Alaska to the northwest, stretching from the Atlantic Ocean in the east to the Pacific Ocean in the west; to the north lies the Arctic Ocean. By total area (including its waters), Canada is the second-largest country in the world—after Russia—and the largest on the continent. By land area, Canada ranks fourth (land area is total area minus the area of lakes and rivers). Since 1925, Canada has claimed the portion of the Arctic between 60°W and 141°W longitude, but this claim is not universally recognized. The northernmost settlement in Canada (and in the world) is Canadian Forces Station Alert on the northern tip of Ellesmere Island—latitude 82.5°N—817 kilometers (450 nautical miles, 508 miles) from the North Pole. Much of the Canadian Arctic is covered by ice and permafrost. Canada also has the longest coastline in the world: 202,080 kilometers (125,570 mi). The population density, 3.3 inhabitants per square kilometer (8.5/sq mi), is among the lowest in the world. The most densely populated part of the country is the Quebec City – Windsor Corridor, (situated in Southern Quebec and Southern Ontario) along the Great Lakes and the Saint Lawrence River in the southeast. The Horseshoe Falls in Niagara Falls, Ontario is one of the world's most voluminous waterfalls. It is renowned for both its beauty and as a valuable source of hydroelectric power. Canada has an extensive coastline on its north, east, and west, and since the last glacial period it has consisted of eight distinct forest regions, including extensive boreal forest on the Canadian Shield. The vastness and variety of Canada's geography, ecology, vegetation and landforms have given rise to a wide variety of climates throughout the country. Because of its vast size, Canada has more lakes than any other country, containing much of the world's fresh water. There are also fresh-water glaciers in the Canadian Rockies and the Coast Mountains. Average winter and summer high temperatures across Canada vary according to the location. Winters can be harsh in many regions of the country, particularly in the interior and Prairie provinces, which experience a continental climate, where daily average temperatures are near −15 °C (5 °F) but can drop below −40 °C (−40.0 °F) with severe wind chills. In no coastal regions, snow can cover the ground almost six months of the year (more in the north). Coastal British Columbia enjoys a temperate climate, with a mild and rainy winter. On the east and west coasts, average high temperatures are generally in the low 20s °C (70s °F), while between the coasts, the average summer high temperature ranges from 25 to 30 °C (77 to 86 °F), with occasional extreme heat in some interior locations exceeding 40 °C (104 °F). Canada is also geologically active, having many earthquakes and potentially active volcanoes, notably Mount Meager, Mount Garibaldi, Mount Cayley, and the Mount Edziza volcanic complex. The volcanic eruption of Tseax Cone in 1775 caused a catastrophic disaster, killing 2,000 Nisga'a people and the destruction of their village in the Nass River valley of northern British Columbia; the eruption produced a 22.5-kilometre (14.0 mi) lava flow, and according to legend of the Nisga'a people, it blocked the flow of the Nass River. Canada is an industrial nation with a highly-developed science and technology sector. Nearly 1.88% of Canada's GDP is allocated to research & development (R&D). The country has eighteen Nobel laureates in physics, chemistry and medicine. Canada is one of the world’s biggest publishers, publishing the highest number of scientific publications in the fields of medical science, natural science and engineering in 2005. Canada ranks as 12 in the world for Internet usage with 28.0 million users, 84.3% of the total population. The Canadian Space Agency conducts space, planetary, and aviation research, as well as develops rockets and satellites. In 1984, Marc Garneau became Canada's first astronaut, serving as payload specialist of STS-41-G. Canada is a participant in the International Space Station and one of the world's pioneers in space robotics with the Canadarm, Canadarm2 and Dexter. Canada was ranked third among 20 top countries in space sciences. Since the 1960s, Canada Aerospace Industries have designed and built 10 satellites, including RADARSAT-1, RADARSAT-2 and MOST. Canada also produced one of the most successful sounding rockets, the Black Brant; over 1000 have been launched since they were initially produced in 1961. Universities across Canada are working on the first domestic landing spacecraft: the Northern Light, designed to search for life on Mars and investigate Martian electromagnetic radiation environment and atmospheric properties. If the Northern Light is successful, Canada will be the third country to land on another planet. Current Canadian banknotes, depicting (top to bottom) Wilfrid Laurier, John A. Macdonald, Queen of Canada (Queen Elizabeth II), William Lyon Mackenzie King, and Robert Borden. Canada is one of the world's wealthiest nations, with a high per-capita income, and it is a member of the Organization for Economic Co-operation and Development (OECD) and the G8. It is one of the world's top ten trading nations. Canada is a mixed market, ranking lower than the U.S. on the Heritage Foundation's index of economic freedom but higher than most western European nations. The largest foreign importers of Canadian goods are the United States, the United Kingdom, and Japan. In 2008, Canada's imported goods were worth over $442.9 billion, of which $280.8 billion was from the United States, $11.7 billion from Japan, and $11.3 billion from the United Kingdom. As of October 2009, Canada's national unemployment rate was 8.6%. Provincial unemployment rates vary from a low of 5.8% in Manitoba to a high of 17% in Newfoundland and Labrador. As of 2008, Canada’s total government debt burden is the lowest among the G8. The OECD projects that Canada's debt-to-GDP ratio will decline to 19.5% in 2009, which is less than half of the projected average of 51.9% for all G8 countries. According to these projections, Canada's debt burden will have fallen by more than 50 percentage points from its peak in 1995, when it was the second-highest in the G8. In 2008–09, the federal debt increased by $6.1 billion to $463.7 billion. In the past century, the growth of the manufacturing, mining, and service sectors has transformed the nation from a largely rural economy to a more industrial and urban one. Like other First World nations, the Canadian economy is dominated by the service industry, which employs about three quarters of Canadians. Canada is unusual among developed countries in the importance of its primary sector, in which the logging and petroleum industries are two of the most important. Canada is one of the few developed nations that are net exporters of energy. Atlantic Canada has vast offshore deposits of natural gas, and Alberta has large oil and gas resources. The immense Athabasca Oil Sands give Canada the world's second-largest oil reserves, behind Saudi Arabia. Canada is one of the world's largest suppliers of agricultural products; the Canadian Prairies are one of the most important producers of wheat, canola, and other grains. Canada is the largest producer of zinc and uranium, and is a global source of many other natural resources, such as gold, nickel, aluminum, and lead. Many towns in northern Canada, where agriculture is difficult, are sustainable because of nearby mines or sources of timber. Canada also has a sizable manufacturing sector centered in southern Ontario and Quebec, with automobiles and aeronautics representing particularly important industries. Representatives of the Canadian, Mexican, and United States governments sign the North American Free Trade Agreement in 1992. Economic integration with the United States has increased significantly since World War II. This has drawn the attention of Canadian nationalists, who are concerned about cultural and economic autonomy in an age of globalization, as American goods and media products have become ubiquitous. The Automotive Products Trade Agreement of 1965 opened the borders to trade in the auto manufacturing industry. In the 1970s, concerns over energy self-sufficiency and foreign ownership in the manufacturing sectors prompted Prime Minister Pierre Trudeau's Liberal government to enact the National Energy Program (NEP) and the Foreign Investment Review Agency (FIRA). In the 1980s, Prime Minister Brian Mulroney's Progressive Conservatives abolished the NEP and changed the name of FIRA to "Investment Canada" in order to encourage foreign investment. The Canada – United States Free Trade Agreement (FTA) of 1988 eliminated tariffs between the two countries, while the North American Free Trade Agreement (NAFTA) expanded the free-trade zone to include Mexico in the 1990s. In the mid-1990s, the Liberal government under Jean Chrétien began to post annual budgetary surpluses and steadily paid down the national debt. The 2008 global financial crisis caused a recession, which could boost the country's unemployment rate to 10%. 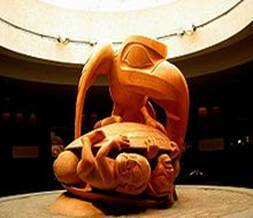 Bill Reid's sculpture Raven and The First Men, showing part of a Haida creation myth. The Raven is a figure common to many mythologies in Aboriginal Culture. Canadian culture has historically been influenced by British, French, and Aboriginal cultures and traditions. There are distinctive Aboriginal cultures, languages, art, and music spread across Canada. Many North American Indigenous words, inventions and games have become an everyday part of Canadian language and use. The canoe, snowshoes, the toboggan, lacrosse, tug of war, maple syrup and tobacco are examples of products, inventions and games. Some of the words include the barbecue, caribou, chipmunk, woodchuck, hammock, skunk, mahogany, hurricane and moose. Numerous areas, towns, cities and rivers of the Americas have names of Indigenous origin. The province of Saskatchewan derives its name from the Cree language name of the Saskatchewan River, "Kisiskatchewani Sipi". Canada's capital city Ottawa comes from the Algonquin language term "adawe" meaning "to trade." National Aboriginal Day recognizes the cultures and contributions of Aboriginal peoples of Canada. Canadian culture has been greatly influenced by immigration from all over the world. Many Canadians value multiculturalism and see Canada as being inherently multicultural. However, the country's culture has been heavily influenced by American culture because of its proximity and the high rate of migration between the two countries. The great majority of English-speaking immigrants to Canada between 1755 and 1815 were Americans from the Thirteen Colonies; during and immediately after the War of Independence, 46,000 Americans loyal to the British crown came to Canada. Between 1785 and 1812, more Americans emigrated to Canada in response to promises of land. American media and entertainment are popular, if not dominant, in English Canada; conversely, many Canadian cultural products and entertainers are successful in the United States and worldwide. Many cultural products are marketed toward a unified "North American" or global market. The creation and preservation of distinctly Canadian culture are supported by federal government programs, laws, and institutions such as the Canadian Broadcasting Corporation (CBC), the National Film Board of Canada, and the Canadian Radio-television and Telecommunications Commission. The Jack Pine, by Tom Thomson, 1916. Oil on Canvas, in the collection of the National Gallery of Canada. Canadian visual art has been dominated by Tom Thomson — Canada's most famous painter — and by the Group of Seven. Thomson's brief career painting Canadian landscapes spanned just a decade up to his death in 1917 at age 39. The Group were painters with a nationalistic and idealistic focus, who first exhibited their distinctive works in May 1920. Though referred to as having seven members, five artists — Lawren Harris, A. Y. Jackson, Arthur Lismer, J. E. H. MacDonald, and Frederick Varley — were responsible for articulating the Group's ideas. They were joined briefly by Frank Johnston, and by commercial artist Franklin Carmichael. A. J. Casson became part of the Group in 1926. Associated with the Group was another prominent Canadian artist Emily Carr, known for her landscapes and portrayals of the indigenous peoples of the Pacific Northwest Coast. Canada has developed a music infrastructure, that includes church halls, chamber halls, conservatories, academies, performing arts centers, record companies, radio stations, television music video channels and governing bodies. The Canadian music industry has produced internationally renowned composers, musicians and ensembles such as; Portia White, Guy Lombardo, Murray Adaskin, Rush and Celine Dion. The national anthem of Canada O Canada adopted in 1980, was originally commissioned by the Lieutenant Governor of Quebec, the Honourable Théodore Robitaille, for the 1880 St. Jean-Baptiste Day ceremony. Calixa Lavallée wrote the music, which was a setting of a patriotic poem composed by the poet and judge Sir Adolphe-Basile Routhier. The text was originally only in French, before it was translated to English in 1906. A scene at the 2010 Winter Olympics in Vancouver seconds after Team Canada won gold in men's ice hockey. Canada's National symbols are influenced by natural, historical, and Aboriginal sources. The use of the maple leaf as a Canadian symbol dates to the early 18th century. The maple leaf is depicted on Canada's current and previous flags, on the penny, and on the Coat of Arms. Other prominent symbols include the beaver, Canada Goose, Common Loon, the Crown, the Royal Canadian Mounted Police, and more recently, the totem pole and Inukshuk. Canada's official national sports are hockey in the winter and lacrosse in the summer. Hockey is a national pastime and the most popular spectator sport in the country. It is also the sport most played by Canadians, with 1.65 million participants in 2004. Canada's six largest metropolitan areas—Toronto, Montreal, Vancouver, Ottawa, Calgary, and Edmonton—have franchises in the National Hockey League (NHL), and there are more Canadian players in the NHL than from all other countries combined. Other popular spectator sports include curling and football; the latter is played professionally in the Canadian Football League (CFL). Golf, baseball, skiing, soccer, volleyball, and basketball are widely played at youth and amateur levels, but professional leagues and franchises are not widespread. Canada has hosted several high-profile international sporting events, including the 1976 Summer Olympics in Montreal, the 1988 Winter Olympics in Calgary, and the 2007 FIFA U-20 World Cup. Canada was the host nation for the 2010 Winter Olympics in Vancouver and Whistler, British Columbia. Notre-Dame-des-Victories in the historic Basse-Ville (Lower Town) of Quebec City, Quebec. The population is mainly French-speaking, with a small English-speaking minority. Canada's two official languages are English and French. Official bilingualism is defined in the Canadian Charter of Rights and Freedoms, the Official Languages Act, and Official Language Regulations; it is applied by the Commissioner of Official Languages. English and French have equal status in federal courts, Parliament, and in all federal institutions. Citizens have the right, where there is sufficient demand, to receive federal government services in either English or French, and official-language minorities are guaranteed their own schools in all provinces and territories. English and French are the mother tongues of 59.7% and 23.2% of the population respectively, and the languages most spoken at home by 68.3% and 22.3% of the population respectively. 98.5% of Canadians speak English or French (67.5% speak English only, 13.3% speak French only, and 17.7% speak both). English and French Official Language Communities, defined by First Official Language Spoken, constitute 73.0% and 23.6% of the population respectively. The Charter of the French Language makes French the official language in Quebec. Although more than 85% of French-speaking Canadians live in Quebec, there are substantial Francophone populations in Ontario, Alberta, and southern Manitoba; Ontario has the largest French-speaking population outside Quebec. New Brunswick, the only officially bilingual province, has a French-speaking Acadian minority constituting 33% of the population. There are also clusters of Acadians in southwestern Nova Scotia, on Cape Breton Island, and through central and western Prince Edward Island. Other provinces have no official languages as such, but French is used as a language of instruction, in courts, and for other government services in addition to English. Manitoba, Ontario, and Quebec allow for both English and French to be spoken in the provincial legislatures, and laws are enacted in both languages. In Ontario, French has some legal status but is not fully co-official. There are 11 Aboriginal language groups, made up of more than 65 distinct dialects. Of these, only Cree, Inuktitut and Ojibway have a large enough population of fluent speakers to be considered viable to survive in the long term. Several aboriginal languages have official status in the Northwest Territories. Inuktitut is the majority language in Nunavut, and one of three official languages in the territory. Over six million people in Canada list a non-official language as their mother tongue. Some of the most common non-official first languages include Chinese (mainly Cantonese; 1,012,065 first-language speakers), Italian (455,040), German (450,570), Punjabi (367,505) and Spanish (345,345). Established1826 as "Town of Bytown"
Incorporated1855 as "City of Ottawa"
Ottawa ( /ˈɒtəwə/ or sometimes /ˈɒtəwɑː/) is the capital of Canada and a municipality within the Province of Ontario. Located in the Ottawa Valley in the eastern portion of Southern Ontario, the city lies on the southern banks of the Ottawa River, a major waterway forming the local boundary between the Provinces of Ontario and Quebec. Connected by several bridges to its Quebec neighbour, the city of Gatineau on the northern shores of the Ottawa River, the two cities and surrounding areas are designated the National Capital Region (NCR). Though governed by separate municipal governments, the federal lands within the region are administered by the National Capital Commission (NCC), a federal crown corporation charged with the responsibility of planning and managing the federal government's interests in the NCR. In 2006, the city of Ottawa had a population of 812,129, making it the fourth-largest municipality in the country and second-largest in Ontario. The Ottawa-Gatineau metropolitan area had a 2006 population of 1,130,761, making it the fourth-largest census metropolitan area (CMA) in Canada. The National Capital Region which encompasses Ottawa, Gatineau and surrounding suburbs and towns has an estimated population of 1,451,415. In 2009 Ottawa-Gatineau's population was estimated at 1,220,674, making it the fifth-largest CMA in Canada. Ottawa is also considered the 4th cleanest city in the world by Forbes magazine and the 18th most liveable city in the world according to the "Mercer Human Resource Consulting Quality of Living Survey". As with other national capitals, the word "Ottawa" is also used to refer by metonymy to the country's federal government, especially as opposed to provincial or municipal authorities. The Centre Block, on Parliament Hill. n December 31, 1857, Queen Victoria was asked to choose a common capital for the Province of Canada (modern day Ontario and Quebec) and chose Ottawa. While Ottawa is now a major metropolis and Canada's fourth largest city, at the time it was a sometimes unruly logging town in the hinterland, far away from the colony's main cities, Quebec City and Montreal in Canada East, and Kingston and Toronto in Canada West. The Queen's advisers suggested she pick Ottawa for many important reasons: first, it was the only settlement of any significant size located right on the border of Canada East and Canada West (today Quebec and Ontario), making it a compromise between the two colonies and their French and English populations;(citation needed) second, the War of 1812 had shown how vulnerable major Canadian cities were to American attack, since they were all located very close to the border, while Ottawa was then surrounded by dense forest far from the border; third, the government owned a large parcel of land on a spectacular spot overlooking the Ottawa River. Ottawa's position in the back country made it more defensible, while still allowing easy transportation over the Ottawa River to Canada East, and the Rideau Canal to Canada West. Two other considerations were that Ottawa was at a point nearly exactly midway between Toronto and Quebec City (~500 km/310 mi) and that the small size of the town made it less likely that politically motivated mobs could go on a rampage and destroy government buildings, as happened in the previous Canadian capitals. The Ottawa River and the Rideau Canal network meant that Ottawa could be supplied by water from Kingston and Montreal without going along the potentially treacherous US-Canada border. In 1866, the legislature was finally moved to Ottawa, after a few years of alternating between Toronto and Quebec City. See also: Capitals of the Province of Canada. The original Centre Block of the Parliament Buildings in Ottawa was destroyed by fire on February 3, 1916. French urban planner Jacques Greber was hired to work on a master plan for the National Capital Region (the Greber Plan). Jacques Greber was the creator of the National Capital Greenbelt, as well as many other projects throughout the NCR. The House of Commons and Senate were temporarily relocated to the recently constructed Victoria Memorial Museum, currently the Canadian Museum of Nature, located about 1 km (1 mi) south of Parliament Hill on McLeod Street at Metcalfe Street. A new Centre Block was completed in 1922, the centrepiece of which is a dominant Gothic revival styled structure known as the Peace Tower which has become a common emblem of the city. On September 5, 1945, only weeks after the end of World War II, Ottawa was the site of the event that many people consider to be the official start of the Cold War. A Soviet cipher clerk, Igor Gouzenko, defected from the Soviet embassy with over 100 secret documents(16). At first, the Royal Canadian Mounted Police (RCMP) refused to take the documents, as the Soviets were still allies of Canada and Britain, and the newspapers were not interested in the story. After hiding out for a night in a neighbour's apartment, listening to his own home being searched, Gouzenko finally persuaded the RCMP to look at his evidence, which provided proof of a massive Soviet spy network operating in western countries, and, indirectly, led to the discovery that the Soviets were working on an atomic bomb to match that of the Americans. In 2001, the old city of Ottawa (estimated 2005 population 350,000) was amalgamated with the suburbs of Nepean (135,000), Kanata (85,000), Gloucester (120,000), Rockcliffe Park (2,100), Vanier (17,000) and Cumberland (55,000), Orleans (84,695), and the rural townships of West Carleton (18,000), Osgoode (13,000), Rideau (18,000), and Goulbourn (24,000), along with the systems and infrastructure of the Regional Municipality of Ottawa-Carleton, to become one municipality. Before 1969 and the creation of Ottawa-Carleton, the city of Ottawa was part of Carleton County. The Ottawa region was long the home of the Odawa or Odaawaa First Nations people. The Odawa are an Algonquin people who called the river the Kichi Sibi or Kichissippi meaning "Great River" or "Grand River". Historical evidence indicates that the Algonquins over time have occupied portions of the lands of the Ottawa River watershed and travelled through surrounding territory as a hunting and gathering society. The Algonquins of Ontario assert that they never surrendered its territory by treaty, sale, or conquest and have made such claims since 1772. In 1983, the Algonquins of Golden Lake (Pikwàkanagàn) presented to the Government of Canada a claim to Aboriginal rights and title within the Ontario portion of the Ottawa and Mattawa River watersheds. Negotiations are ongoing. Early European explorers of the St. Lawrence and Ottawa Rivers sought new territories, claimed lands in the names of their kings and queens, and sought western passages to India and Asia as well as gold and other precious commodities. Among the first of commercial enterprises to evolve in the New World after fishing, the fur trade industry, largely influenced by the Hudson Bay Company, used the Ottawa River and its tributaries as the local conveyance for the delivery of fur products to Europe through Montreal and Quebec City. The first settlement in the region was led by Philemon Wright, a New Englander from Woburn Massachusetts who, on March 7, 1800 arrived with his own and five other families along with twenty-five labourers to start an agricultural community on the north bank of the Ottawa River at the portage to the Chaudière Falls. Food crops were not sufficient to sustain the community and Wright began harvesting trees as a cash crop when he determined that he could transport timber by river from the Ottawa Valley to the Montreal and Quebec City markets, which also exported to Europe. His first raft of squared timber and sawn lumber arrived in Quebec City in 1806. Liked by many European nations for its extremely straight and strong trunk in heavy construction for shipbuilding and housing as well as for furniture, the white pine (Pinus strobus) was found throughout the Ottawa Valley, soon booming based almost exclusively upon the timber trade. By 1812, the timber trade had overtaken the fur trade as the leading economic activity in the area as Ottawa became a centre for lumber milling and square-cut lumber in Canada and North America. In the years following the War of 1812, along with settling some military regiment families (such as the 100th Regiment of Foot (Prince Regent's County of Dublin Regiment) at Richmond, Ontario), the government began sponsored immigration schemes which brought over Irish Catholics and Irish Protestants to settle the Ottawa area, which began a steady stream of Irish immigration there in the next few decades. Along with French Canadians who crossed over from Quebec, these two groups provided the bulk of workers involved in the Rideau Canal project and the booming timber trade, both instrumental in putting Ottawa on the map. The region's population grew significantly when the canal was completed by Colonel John By in 1832. It was intended to provide a secure route between Montreal and Kingston on Lake Ontario, by-passing the stretch of the St. Lawrence River bordering New York State (the U.S invasions of Canada in the War of 1812 being a recent memory). Construction of the canal began at the northern end, where Colonel By set up a military barracks on what later became Parliament Hill, and laid out a townsite that soon became known as Bytown. Original city leaders of Bytown include a number of Wright's sons, most notably Ruggles Wright. Nicholas Sparks, Braddish Billings and Abraham Dow were the first to settle on the Ontario side of the Ottawa river. The west side of the canal became known as "Uppertown" where the Parliament buildings are located, while the east side of the canal (wedged between the canal and Rideau River) was known as the "Lowertown". Lowertown was then a crowded, boisterous shanty town, frequently receiving the worst of disease epidemics, such as the Cholera outbreak in 1832, and typhus in 1847.Bytown was renamed Ottawa in 1855, when it was incorporated as a city.